Gem stone jewelry is worn by millions of people on almost every part of the globe. With the rapid development of gem stone jewelry production in many nations, the options for gem stone gold jewelry or sterling silver gem stone jewelry is mind boggling. 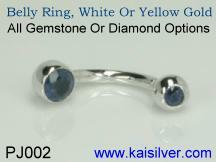 The price range for fine gem stone jewelry can vary widely depending on a few factors. Gold gem stone jewelry would surely be more expensive as compared to silver jewelry with gem stones, because of the high price of gold. It is important to note that, there is really no reason why sterling silver jewelry with gems should have inferior craftsmanship as compared to gem stone jewelry with gold. 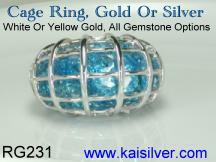 The term 'fine gem stone jewelry' should include both gold and silver jewelry with gem stones. 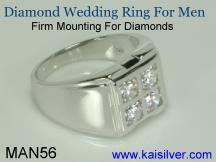 Kaisilver is the world's leading online provider of high end gem stone jewelry. All our custom gem stone jewelry is worked on by some of the finest craftsmen and we do not mass produce our merchandise. 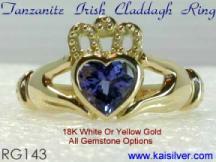 All jewelry can be ordered in 14k or 18k white or yellow gold with gem stones of your choice. You can choose from our gorgeous designs or send us images of your favourite designs to be custom made. Since individual attention is provided to every single jewel all your preferences can be taken care of and we provide a high degree of customization and flexibility that no other jeweler can match. 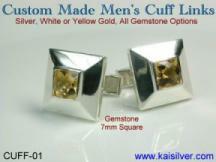 On this page we introduce you to some of the custom made fine gem stone jewelry created by us. Our buyers include members of the U.S armed forces, doctors and surgeons, engineers, sportsmen, lawyers, resort and casino owners, government officials, fashion models, and others from every walk of life. Spend some time browsing our merchandise and you will realize why we are the most preferred source for high end gem stone jewelry. We do not compete on price and do not compromise on quality and this ensures that you get the best value for your money. Why Is Gem Stone Jewelry Worn? Gem stone jewelry is not something new or recent, the history of jewelry with gem stones can be traced back to many hundred years. The beauty of gem stone jewelry was always something that fascinated mankind but there are a few other reasons for wearing gem stone jewelry too. In the next few paragraphs we will try to cover the major reasons for which jewelry with gem stones is worn. (01) The Beauty Of Gem Stones: The beauty, color and glitter of gem stone jewelry will impress almost all of us. The study of gem stones has today developed into an entire science and you will today find a gem stone in just about any color that you fancy. 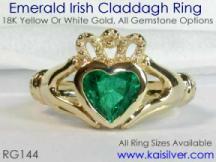 For example, gem stone jewelry with green gem stones could include gems in almost half a dozen shades of green. Jewelry with green gem stones would surely include, emeralds, peridot, green tourmaline, green apatite, green jade and chrysoprase. 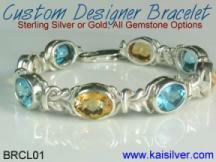 The same can be said of almost any gem stone color that is used to make jewelry. Another interesting option when talking about gem stone jewelry is the possibility of combining gem stones or mixing and matching gem stones of different colors in the same jewel. 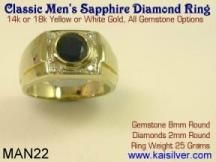 You could for example combine a yellow citrine gem stone with a red garnet gem stone in your ring. Or if you need a less stark color contrast then consider combining a light blue topaz gem stone with a very deep blue topaz gem stone in your ring or pendant. The effect is soothing and almost hypnotizes your senses. The options are endless so let your imagination run wild. (02) Gem Stones As Birthstones: There are certain types of gem stone jewelry that have a special meaning and importance for the people who wear them. 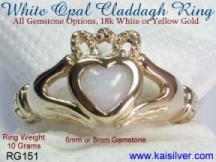 There is a belief since ancient times that a gem stone represents the day on which any person was born. A jewel worn with the birth stone set in it is supposed to bring good luck and good fortune to the person wearing the birth stone jewel. 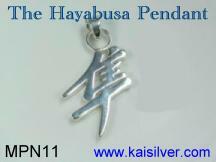 We have included a table below that specifies the birth stone that represents the 12 months of the year. 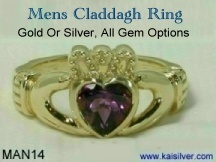 At Kaisilver, all gem stone jewelry can be made with gem stones of your choice and you can therefore order any jewel as a birth stone jewel. (03) Special Properties Of Gem Stones: Ancient records can be found of popular beliefs regarding the special healing and curing properties of gem stones. Wearing of gem stone jewelry was influenced by such beliefs in almost all parts of the world. An example is bloodstone which is supposed to improve blood circulation and carnelian which is believed to bring calm and peace to the mind. Pendants, amulets and rings were the most common forms of gem stone jewels that were worn to harness the special powers and properties of gem stones. 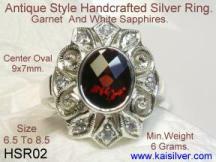 Kaisilver does not garauntee any special healing powers of any gemstones and the information here is provided only as a record of historical occurences. (04) Prestige Value Of Gem Stone Jewelry: The wearing of gem stone jewelry as a show of wealth and status was a later development. Certain gem stones are mined in abundance like amethyst, citrine, topaz etc and do not command a very high price. However, gem stone jewelry with gems like rubies, sapphires, emeralds and tanzanite can be very expensive and are often used as a show of wealth. 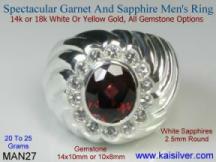 These gem stones are not very common and it is even more difficult to find them in larger sizes and good quality. Gem stone jewelry studded with gem stones and diamonds are popular fashion accessories for wealthy buyers. 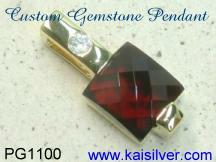 In the above paragraphs we have tried to explain the reasons for the growing popularity of gem stone jewelry. Depending on the type of gem stones and the reason for wearing the jewelry, prices can range from a few dollars to a few thousand dollars. 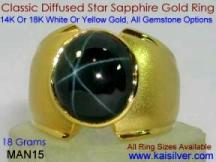 Kaisilver is the world's leading online provider of high end custom gem stone jewelry and all jewelry can be ordered in white or yellow gold with gem stones of your choice. 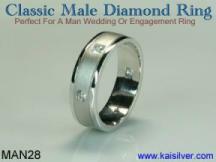 Why Buy Custom Jewellry From Kaisilver? 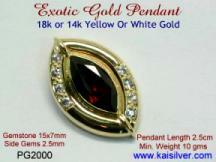 The Name You Can Trust: Kaisilver is the world's largest online provider of high end custom jewellry. Our buyers include fashion models, news readers, hotel and resort owners, members of the U.S and U.K armed forces, business professionals and doctors. We are directly networked to all the leading gemstone producers in over 15 nations. Over 3,500 skilled craftsmen and 5 of the best designers work on all Kaisilver orders. ....... received ring yesterday as you promised. it is stunning, more beautiful than i expected. the design and craftsmanship are outstanding. thank you again, it has been a pleasure doing business with you. i will highly recommend you to everyone i know, and look forward to doing business with you in the future. your entire staff has been professional and you displayed a high degree of honesty and integrity throughout the transaction. thank your staff and your craftsman for their incredible work. please feel free to use me as a reference as a EXTREMELY satisfied customer. take care, i wish you all well. Lt. Colonel James William Brady USA, Ret. Beverly Hills, Florida. 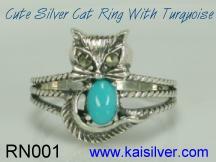 Click Here to visit our custom jewellry section. Before we wind up this section on gem stone jewelry we would like to mention a few interesting facts that few other jewellers would ever disclose. 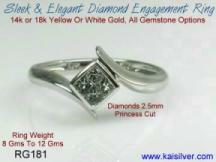 At Kaisilver, we believe that a well informed decision is in everyones interest and therefore try to provide complete facts and details. 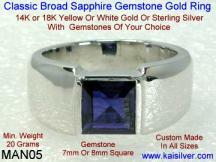 Please spend some time and read the next few paragraphs, if you have any queries or doubts related to gem stones or jewelry, you can email us at sales@kaisilver.com and our team of experts will answer all your queries. 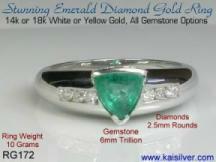 Strange Facts: Emerald gem stones need special care when wearing and storing. Gem stone jewelry with emeralds can be very expensive so you should be aware of how to look after your gorgeous emerald gem stone jewelry. 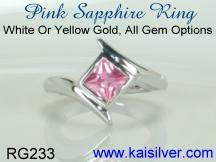 Gem stones like kunzite will fade in color when exposed to bright light. This is a natural occurence and does not mean that kunzite that fades is not of good quality. Traders often refer to chrysoprase as Australian jade, but chrysoprase is infact not jade at all and is a form of chalcedony. Gold Color: If you choose to order your gem stone jewels in white gold remember that, dark colored gem stones will appear all the more dark when set in white gold. 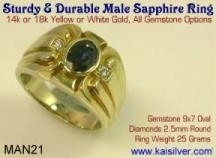 This is because of the stark contrast between the dark colored gem stone and the bright color of white gold. 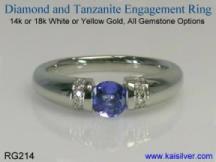 Choose medium colored gems if they are to be set in white gold. 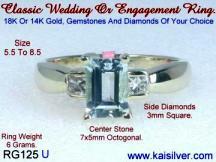 Gem Stone Setting: There are different ways in which gem stones can be set in jewelry. 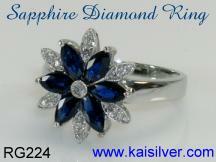 If your gem stone jewelry has prongs, ensure that the prongs are sturdy and not very thin or pointed. Prongs have a tendency to stick in pockets and other places and can then open up. This could cause the gem stones to become loose and even drop off. Thin prongs could easily open up and also scratch and damage delicate skin. 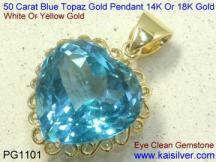 Expensive Gem Stones: Gem stone jewelry can be made from various type of gems. 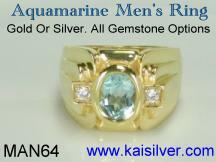 We will not consider man made or synthetic gem stones but even genuine gems can have widely differing prices. Gem stones like sapphire, emerald, ruby and tanzanite are not as abundant as gem stones like amethyst, citrine etc and are therefore more expensive. Gem stone jewelry with gems like aquamarine, tourmaline, iolite and opal are not as expensive as jewelry with gems like rubies and sapphires. It is very unlikely that buyers of gem stone jewelry would have complete knowledge of gems. Most sellers take advantage of this and are over enthusiastic to push buyers into making an impulse purchase. 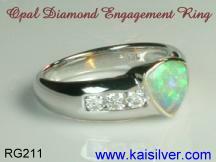 Look for a jeweler who is willing to work with you and answer all your queries and doubts. It is rightly said that the right way to select a jewelry source is to '...... value the jeweller before you value the jewelry '.